There are plenty of cleaning woes to deal with throughout our homes. And those ever-present cleaning frustrations may not have easy solutions, but luckily, there's one exasperating area that we can actually clean: underneath our beds. As adults, there are no longer monsters under there — instead, there are legions of dust bunnies, which is just as scary. But no need to worry. 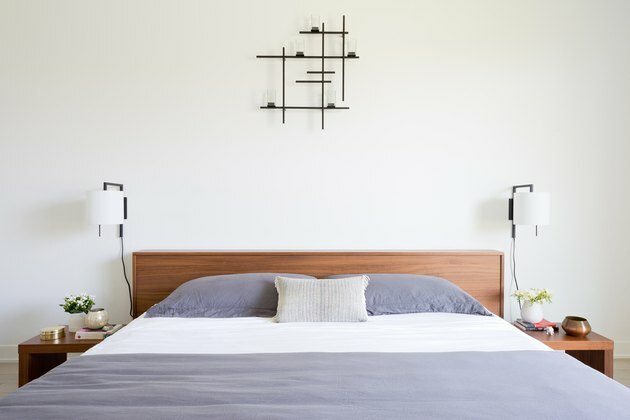 If you can't seem to figure out how to get to the far reaches under your bed (and you'd prefer not to break a sweat trying to move it), here are five ways to clean that final frontier also known as the space beneath your bed. 1. Use a duster with a long handle. With all of the handy products that are out there, it's literally never been easier to clean those pesky spots underneath your bed. For instance, to tackle annoying under-the-bed dust, look no further than a duster with an extendable handle — Swiffer makes some great ones. These dusting wonders have microfibers that will reach every square inch under your bed, and they work especially well if you have hardwood floors. Remember to get a duster with a handle that's long enough to accommodate the size of your bed. 2. Finally put your vacuum's attachments to work. Pretty much all vacuums come with a set of tools that can make us scratch our heads, but they actually do serve a practical purpose. You can use an extension wand to get those small, tough-to-reach places, or a mattress attachment can clean the bottom, top, and sides of your mattress. If you can't seem to track down your attachments, you can always flatten your vacuum and push it underneath the bed. 3. Invest in a robot vacuum. Vacuuming can be a bit of a workout, so if you'd prefer a sweat-free alternative when cleaning underneath your bed, consider buying an iRobot from Roomba or a similar company. From carpet to hard flooring, you can choose the robot vacuum that makes the most sense for your space. Set it up, charge it, and let your handy little friend make the area under your bed pristine. 4. Blow those dust bunnies away. OK, so this may sound kind of funny, but as it turns out, a blow dryer (or small fan) is a quick and nearly painless way to make all of those dust bunnies go whoosh! in a hurry. Watch them shift from every crevice — just be sure to arm yourself with a duster, broom, or vacuum to clean up all of the dust once it escapes from underneath your bed. 5. Get creative with duct tape. Although the brush-end of a broom can be helpful when cleaning under a bed, the handle can be equally, if not more, effective when you try this hack. Simply wrap the handle in duct tape and roll it or push it back and forth underneath the bed as if you're using a giant lint roller. If the area is really dusty, it may take some fresh tape and a few passes to make it spotless.